Bronx Borough Hall and Court House are located at 851 Grand Concourse, Bronx NY 10451; phone: 718-590-3646 (county clerk). 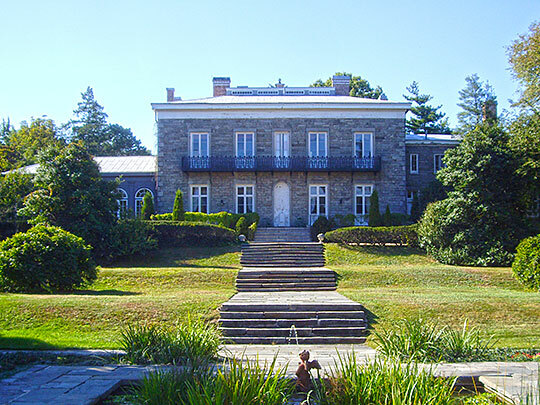 Photo: Bartow-Pell Mansion, ca. 1836, 895 Shore Road North (Pelham Bay Park), Bronx, NY. Listed on the National Register of Historic Places in 1974. Photographed by user:Dmadeo (own work), 2007, [cc-by-3.0 (creativecommons.org/licenses/by/3.0)], via Wikimedia Commons, accessed December, 2013. Two years before the nation celebrated the 100th anniversary of the Declaration of Independence, the limits of New York City were expanded, for the first time in its history, beyond the shores of Manhattan Island. On January 1, 1874, the townships of Kingsbridge, West Farms and Morrisania (which were then part of the Borough of the Bronx in Westchester County) became a part of New York City by authority of the State legislature. Today the area constitutes that part of the Borough of the Bronx (in Greater New York) lying west of the Bronx River. On November 6, 1894, a proposal to consolidate certain localities adjacent to New York was submitted to popular vote. Included among these localities was an area within Westchester County that had not been annexed in 1874. This part of the county now voted against the proposal. But the adverse majority was so small that it was ignored by the annexationists; and on July 1, 1895, the whole section east of the Bronx River became a part of New York City, as a result of Senator Robinson's Annexation Bill. This action occurred three years prior to the effective date of the enabling legislation that created Greater New York. The territory thus taken included Throg's Neck, Unionport, Westchester, Williamsbridge, Bronxdale, Olinville, Baychester, Eastchester, Wakefield and Barrow. The history of the area embraced in these two annexations north of the Harlem River is very confused, representing the coalition of several villages that had been assembled little by little in an uneven manner. In 1874 and 1895, the annexations already noted made the old Borough of the Bronx, in Westchester County, part of New York City under the then existing charters. In 1896-1897, the charter of the proposed Greater New York was prepared, submitted to the people and approved. On January 1, 1898, the area comprising the 1874 and 1895 annexations north of the Harlem River, which was already part of New York City, became the Borough of the Bronx in Greater New York.